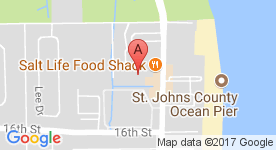 Welcome to Regency Inn and Suites, conveniently located only minutes from the historic downtown area, steps from St. Johns County Ocean Pier, and just across from St. Augustine Beach Volleyball Courts. Our hotel has plenty of free parking, a complimentary continental breakfast, and customer service that is second to none. You can share photos with family at home or stay connected to the office using our free Wi-Fi, and our refreshing indoor pool is heated for year-round use. Whether you need a Jacuzzi room for a romantic weekend getaway, three double beds that comfortably sleep 6 for a fun-filled family vacation, or a spacious king room for an overnight business trip, our charming hotel has exactly what you’re looking for. Our comfortable accommodations include cable TV, a microwave and refrigerator, and an iron and ironing board, giving you all the comforts of home when you’re on road at Regency Inn and Suites.